The earliest system for teaching poor children in England generally came from the church in the form of a Sunday School. 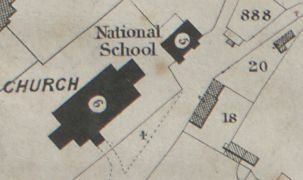 It is then not a surprise to find that the original school building for the National School (later St Mary’s School) in Thornbury was across the road from its present site and next to the church, squeezed into a corner of the churchyard between the road and land belonging to Thornbury Castle. A grant of £100.00 was offered by the National Society, but the Vicar apparently had to turn it down as no land or suitable property had become available. 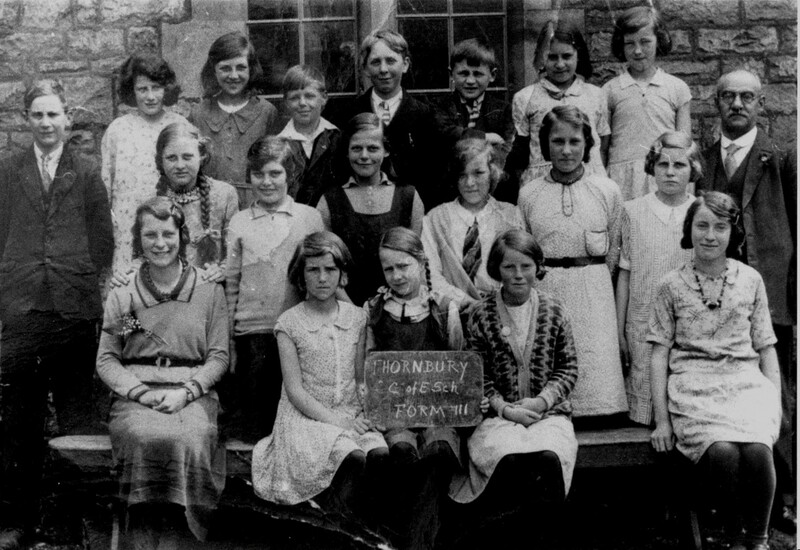 We have not seen the original documents but the school referred to here may have been a Sunday School rather than a full time school as the above mentioned booklet published by the school says it was founded in 1839. The section from the Tithe Apportionment Map drawn up between 1838 and 1840 (seen on the left above) describes the school as the “National School” and shows its position close to the church building. Albert Verrall. 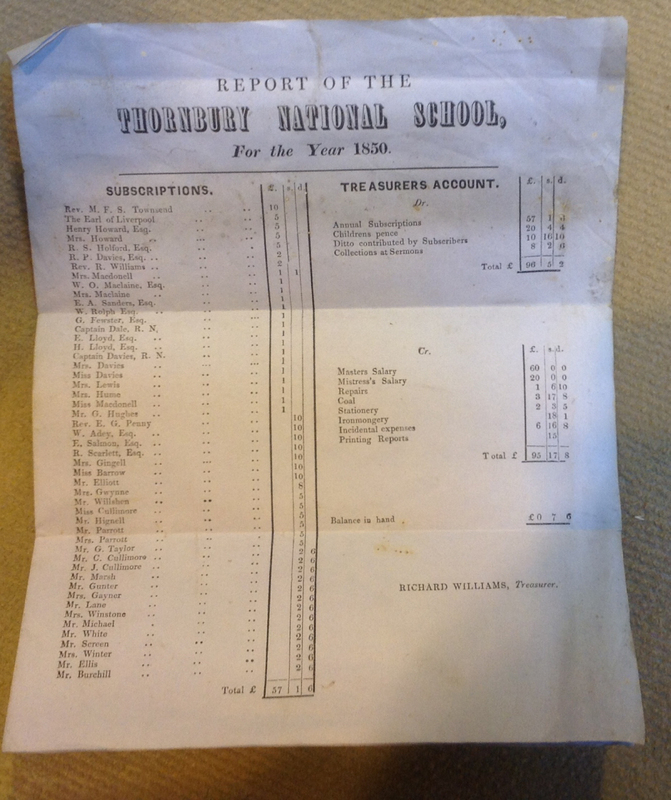 By 1849 the teacher at the National School was Albert Verrall. The 1851 Census shows that Albert Verrall was probably lodging with Griffiths Hughes at 56 High Street. One of Griffiths Hughes’ sons John Griffiths Hughes was a pupil teacher at the National School. We have some evidence that Albert Verrall was trained by the National Society itself. The Ipswich Journal of December 11th 1847 carries a petition signed by the students at the National Society’s Training Institution in Battersea which said “we are anxious to abstain from controversy and keep the school of poor children free from religious feud; but we are ready at all times to declare our deep and unalterable attachment to the English Reformation.” This petition was in answer to comments that implied the students were being taught religious beliefs closely allied to the Roman Catholic tradition and is part of an ongoing dispute about education that led to the formation of the British Schools for children of Nonconformist families. The trade directories for 1856 show that Joseph Lugg and Miss Priscilla Harris were schoolmaster and mistress of the National School. Priscilla Harris – we have no further trace of Priscilla Harris. It seems possible that she was the daughter of William Harris and that she lived with him and her brother in Gillingstool in the 1851 census. This Priscilla Harris married Herbert Wells on 13th May 1856 and if this is the lady who was the teacher it seems unlikely she could then continue in her employment after her marriage. However we have at present no further evidence to support this supposition. Priscilla was listed in the 1861 census living in Llawhaden in Pembrokeshire with Herbert and a young son, Charles William who was born in Thornbury in 1859. Steps were in hand at this time to obtain the land required for a new school opposite the Church. 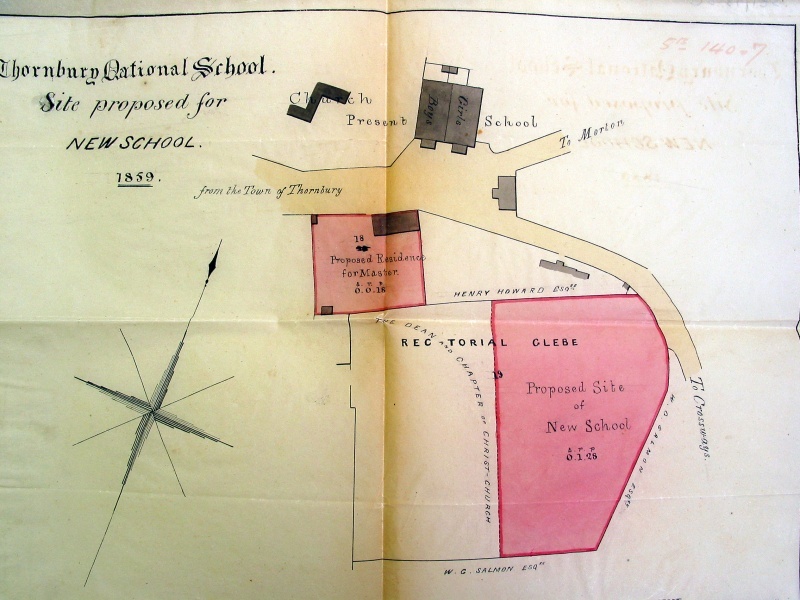 The sites for the new school and the schoolmasters house were to be on Rectorial or Glebe land owned by the Dean and Chapter of Christ Church College Oxford and leased by the Vicar of Thornbury to provide an income for the church. The ongoing issue seems to have been that if a piece of the Rectorial land or Glebe were to be used, the rents and consequently the income would be permanently diminished. Maurice Stephens seems to have found an acceptable solution in that he proposed that Oldbury should be sectioned off from the parish of Thornbury and become an entirely separate parish. This would mean that the Rector of Thornbury would no longer have to provide for the upkeep of the church at Oldbury out of his income from the tithes. Fields directly in front of the vicarage at Oldbury belonged to the Rectory and these would be given to the new parish of Oldbury to provide an income for that church. To explain the details of his case he enclosed a list of the lands in the Rectorial Glebe and the incomes from these properties as agreed in the recent Tithe Apportionment. At this time it was also agreed that Falfield should become independent in the same way. Mr Howard of Thornbury Castle was concerned about the fairness of this scheme with regard to the newly formed parish of Oldbury. Richard Scarlett as his steward wrote to Maurice Stephens and the Dean and Chapter of Christ Church in April 1862 on Mr Howard’s behalf offering to pay £150 which was half of the money needed to buy or build a suitable vicarage for Oldbury. The other two parties were to find the remaining £150. Maurice Stephens agreed to place a curate at Oldbury with a stipend of £100 a year. Correspondence held in Christ Church shows that Maurice Stephens as the vicar of Thornbury was feeling very aggrieved at finding himself in the situation where he was paying out £35 a year to support the school, paying for curates at Falfield and Oldbury and paying towards the costs of building a vicarage at Oldbury. There are some very heartfelt appeals for financial help from Christ Church in the later months of 1862. Now that all the difficulties of providing the land were finally resolved the arrangements for the buildings themselves could go ahead. The plans for the new School and Masters House were drawn up and builders tended their valuations. A firm called Burchells (run by Daniel Burchell) came up with the price of £957.00, but with alterations to the plans it was brought down to £831.00. With grants from their Lordships, the National Society and the sale of the old School to Mr Howard, the Church was still left with a shortfall, the treasurer had to appeal for more donations from local Churchmen. 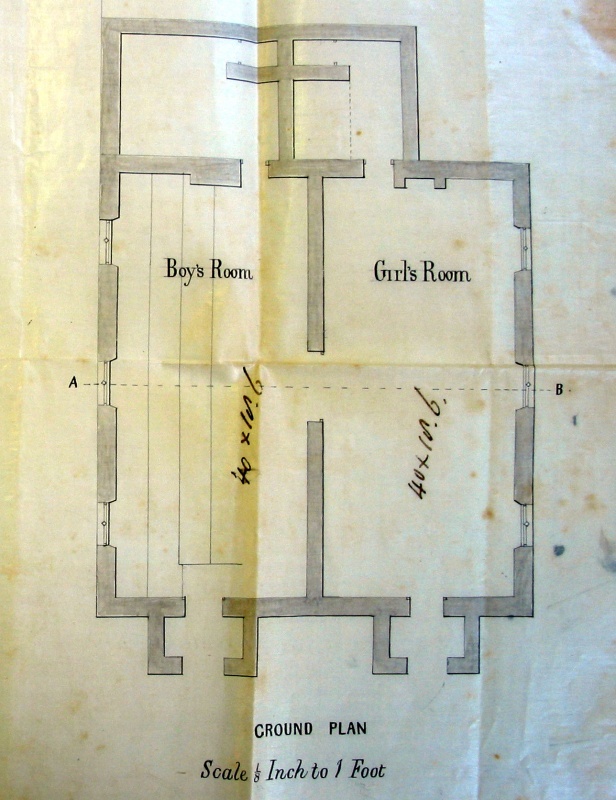 We have noted that the costs for re-building show that the original building on the site was to be altered to make it suitable for the school master’s house. The four thumbnails below show the plans of the new school. Click on each thumbnail to see a larger image. The land was at last freely conveyed to the Archdeacon of Gloucester in 1860, and the School was eventually built in 1862, only 35 years after the Vicar’s original letter! The School had two entrances. The one for the girls used a right of way running between the School House and the garden of Pound Cottage which was owned by Mr A. H. Howard who granted the right. The boys entrance was from Church Road. The toilets, or privies as they were called then, were outside. A coal shed separated the boys from the girls. The playground was a lot smaller than today and boys and girls were once again segregated. Mr and Mrs Warren – they were appointed as Master and Mistress in 1863. We don’t know anything about them nor how long they stayed. They are not listed in the 1862 or 1867 rate books. The next two headmasters stayed longer – in fact between them they stayed for over 70 years!